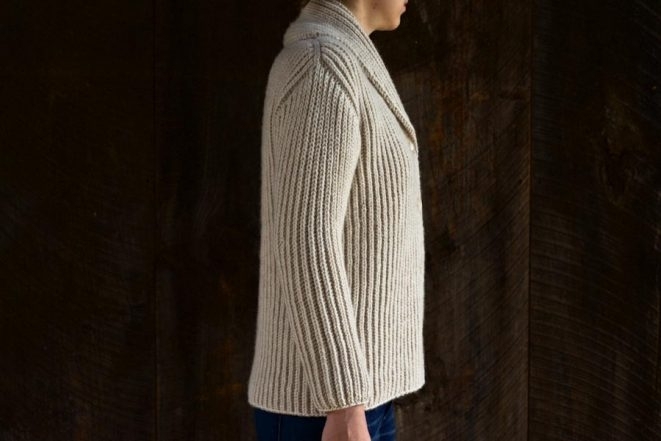 From my mother baking bread in her favorite cream-colored version to Steve McQueen debonairly sporting his at Big Sur in the 1960s, the shawl collar cardigan has always permeated my imagination as the epitome of easy style and grace. Our version, the Top-Down Shawl Collar Cardigan, nods to the classic elements we love while bringing our own flavor to the design. 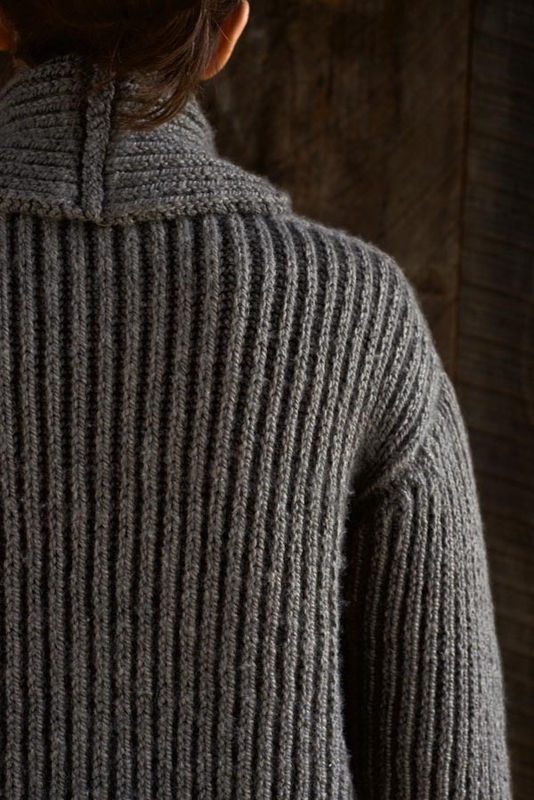 In a hardy and distinctive Fisherman’s Rib and with a big, toasty collar, our Top-Down Shawl Collar Cardigan is substantial enough to stand in as a jacket and cozy enough to wear on Sunday’s in the kitchen or on craggy cliffs overlooking the Pacific Ocean. 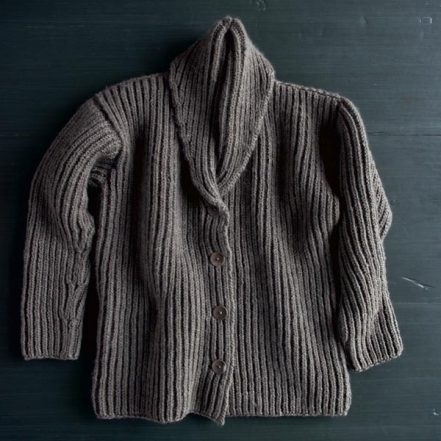 We knit up our Cardigan in Purl Soho’s Worsted Twist Heather, a super soft, 100% merino yarn that comes in a palette of beautiful, nature-inspired colors. And for the perfect finish, chose our new Dyed to Match Buttons, custom hand dyed to coordinate with each and every color of Worsted Twist Heather! 11 (12, 13, 15, 16, 17) skeins of Purl Soho’s Worsted Twist or Worsted Twist Heather, 100% merino wool. Four 1-inch buttons. We used Purl Soho’s Dyed to Match Buttons. EASE: This garment is designed with a 2- to 4-inch ease around the chest. 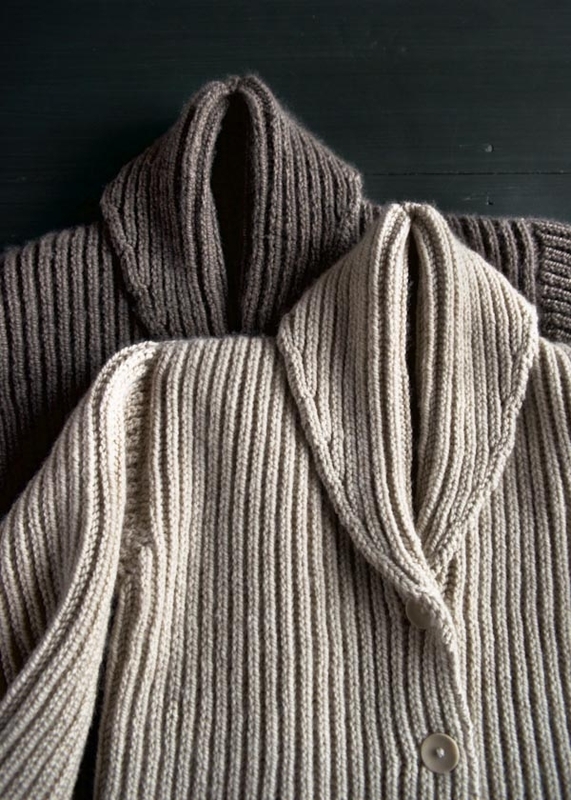 SAMPLE: The sweater in Wheat Flour is size 34 ¾, and the sweater in Tabby Gray is size 38 ¼. 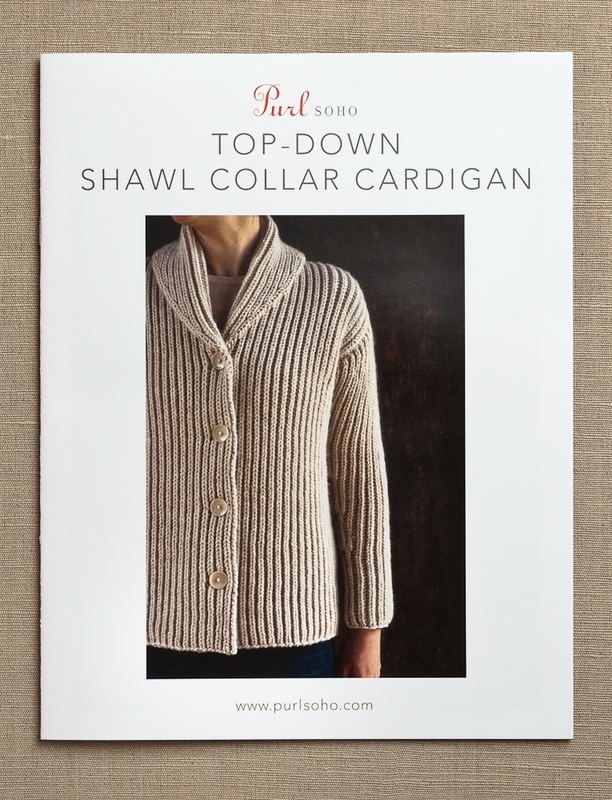 The Top-Down Shawl Collar Cardigan pattern is available for purchase as either a hard copy or download. Do you offer this pattern free of charge or how much is it just for the pattern, as I have my yarn and teach knitting to a group of ladies, and need new designs. 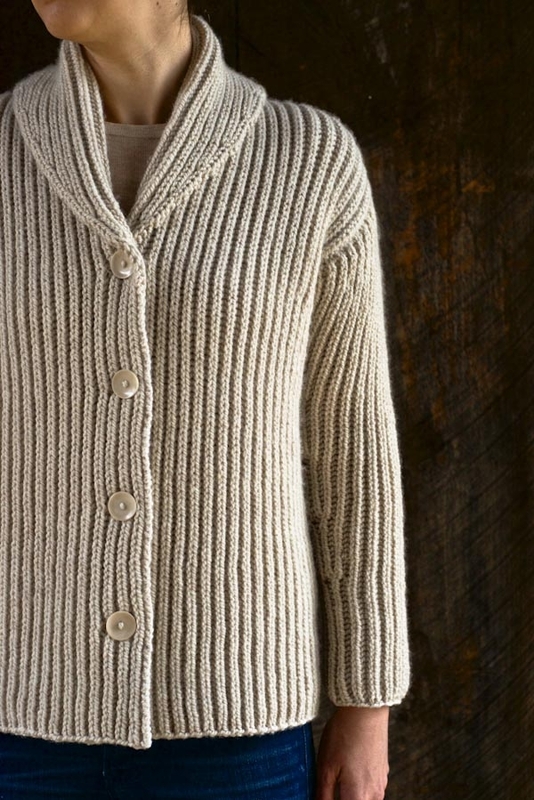 You can purchase our Top-Down Shawl Collar Cardigan pattern at this link. It is $12.50. 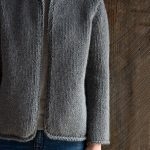 According to the Craft and Yarn Council, the sweater would be classified as “Experienced,” only because we used short rows to create the caps of the sleeves. 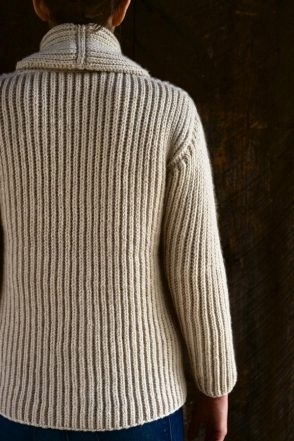 The rest of the pattern would be considered “Intermediate.” You will need to know how to increase in the Fisherman’s Rib pattern and how to sew a few pieces together (which we explain how to do), how to knit in the round, and, for a few of the sizes, how to knit on double pointed needles. We are always here to help you with any questions you may have along the way! Thanks for writing! Finally the perfect pattern for the yarn I brought home from Scotland in 1993. I just knew it would come along some day! Gorgeous and classic (like all your patterns). Can you identify where the garment is seamed? I see you mention short rows for the sleeve caps so I’m assuming that the sleeves are picked up and knitted, so where does the seaming come in? Thanks for your kind comments! 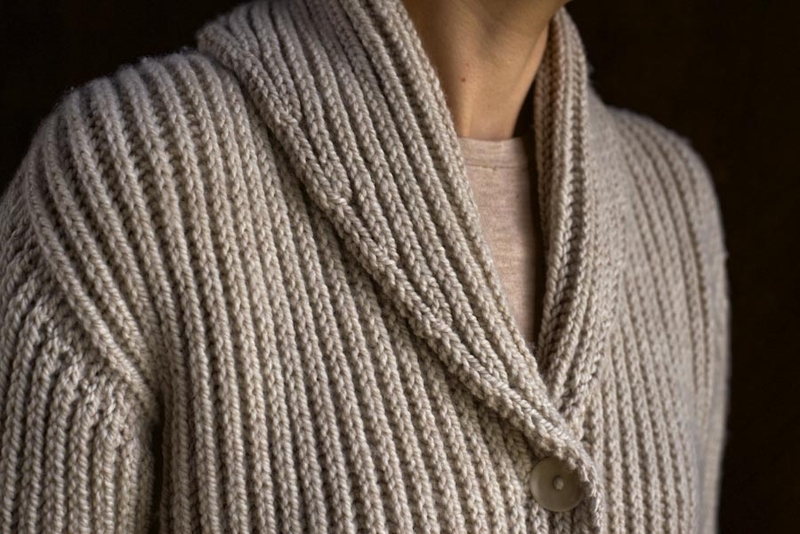 In general, I’m also not a fan of seams, although the ones we used for this cardigan are both quite easy and will help your joins look especially neat and tidy. You’ll sew the collar pieces together, and then later the Back to the Front. The seams are worked straight across, using a simple running stitch underneath the stitches, and we’ve included step-by-step photos to help along the way. We’re also always on hand to answer any questions should you get stuck! Thanks for writing in! Whoa, it’s really beautiful but a size small would be $252! That’s one expensive sweater. If the yarn goes on sale, I’ll buy it. Thank you Kristy. I am so in love with this pattern and the yarn looks wonderful too. I’d like it to be a luxurious feel so, we’ll see… Beautiful pattern! Is this a straight garment or wider in the hip area? 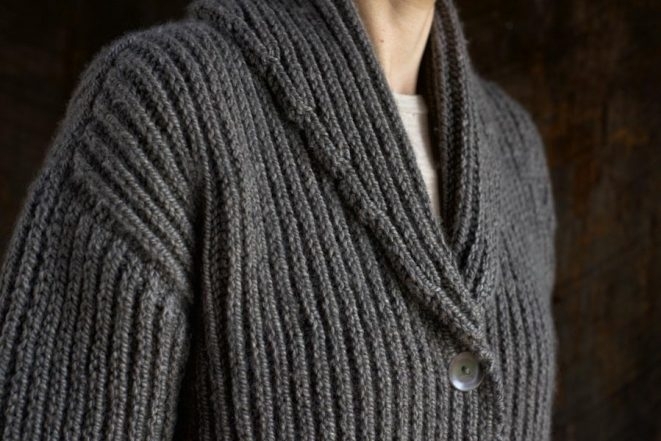 The body of the cardigan is knit straight, although the Fisherman’s Rib stitch does have a fair amount of stretch and give. Because the piece is knit from the top down, it would also be easy to try the piece on as you go and include increases at any specific location along the way as needed. Thanks for writing and please let us know if you have any further questions! For length, the finished length from the Shoulder to the Bottom Edge (for sizes 34 3⁄4 (38 1⁄4, 41 3⁄4, 45 1⁄4, 49, 52 1⁄2) inches), is: 25 (26, 26 1/2, 27 1⁄4, 27 3⁄4, 28 3⁄4) inches, and the finished length from the Underarm to the Bottom Edge is: 17 1⁄2 (18, 18, 18 1⁄2, 18 1⁄2, 19) inches. Hope this helps clarify! Please let us know if you have any further questions! Is there a difference between Fisherman’s rib and Shaker rib? I want to knit a swatch to determine if this sweater will be too warm for me. Thanks for all your inspirational creations. This sweater is gorgeous. Great question! 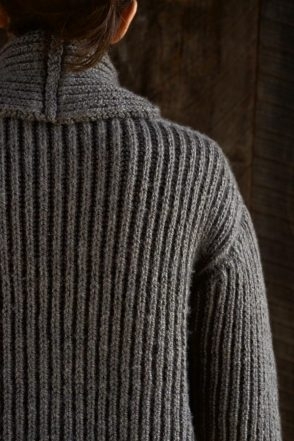 A traditional Shaker Rib stitch is very similar to Fisherman’s Rib, with the exception that every other row is knit straight, which provides a slightly less thick fabric. Shaker Rib is sometimes referred to as “Half Fisherman’s Rib” because of this. I hope this helps clarify! Please let us know if you have any other questions and thanks for writing with this one! Regarding the question above for substituting with Cascade yarn- would you recommend the Cascade 220 or the Cascade 220 Aran? I absolutely love the Worsted Twist- it is such a joy to work with and the results are perfect. Just wondering which yarn would be a close second? Thanks! The recommended needle size for the Cascade 220 is 6-8, which might make it a better choice for you in terms of matching gauge (over the Cascade 220 Superwash, which recommends a size 8-9 needle). We used a size 7 for this pattern with our Worsted Twist Heather. I hope this helps and please let us know if you have any further questions! Thanks for writing! I am about to begin this beautiful cardigan and I am very excited. 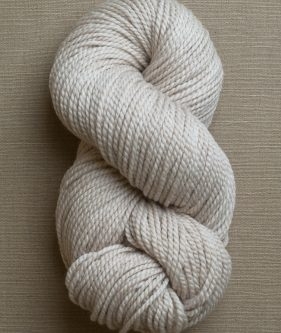 I am using an alternative yarn that is 53% merino and 47% cotton and has a high twist. The suggested gauge is 18 st/24 rows over 4 in on an 8 – 9 needle. I want to make sure that my gauge is correct. I have cast on 41 sts for the left back collar and given the recommended gauge of 4.5 sts/in, I believe this piece should measure slightly over 9 in. When measuring, should the swatch be slightly stretched or not at all? My swatch is quite lofty and my knit stitches appear to be more open than the sweater photos. My row gauge is 6 rows per inch. The look of it is very nice with just the right density. Do you think I can make this work? It’s exciting that you’re about to start the cardigan! The best way to check your gauge and to see what adjustments might be needed would be to work up a small swatch of about 4 inches wide and 4 inches long. This is a slightly less fun part of the process but can save you hours of headache and having to undo your work if your gauge is off. The swatch does not need to be stretched when measuring. If you are getting a row gauge of 6 rows per inch, the pattern calls for a row gauge of 9 stitches per inch, and so you may need to go down a needle size to match that number. Also, it’s helpful to keep in mind when counting your row gauge, in Fisherman’s Rib, each elongated knit stitch that you’ll see represents two rows of knitting because you’re knitting certain stitches in the row below. I hope that this helps clarify! We’re always here to answer any questions you may have along the way! Thanks for writing! 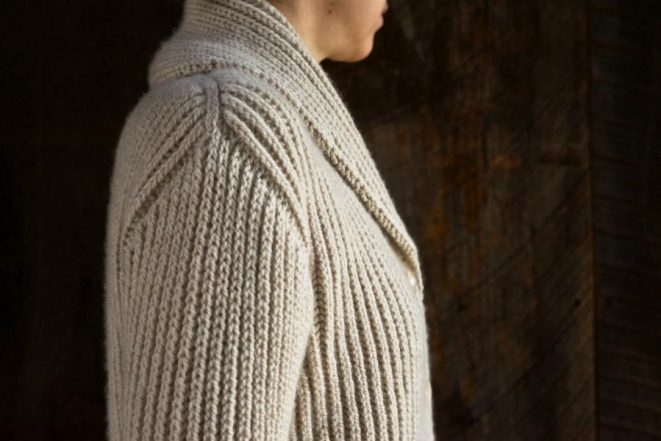 Yes, in Fisherman’s Rib, each elongated stitch in a column of knit stitches represents two rows. As you work up your swatch, if you just keep track and work 9 rows in Fisherman’s Rib, you can then measure and see how close to an inch you are getting. If you measure more than an inch, you’ll need to try a smaller needle. Alternatively, you can also work up a swatch in stockinette stitch and see how close to the pattern’s gauge you’re able to get in stockinette, which is 16 stitches and 22 rows = 4 inches. Please feel free to write back with any further questions! Good luck! This was my first time doing a long tail cast on. Because my tension wasn’t perfect, there are a couple of bumps along the edge. Will I be sewing the two collar pieces together along the cast-on edge, so that the bumps can be dealt with in the seam? Thanks! 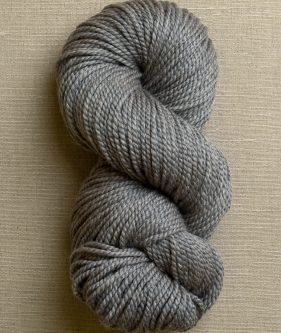 Also, I didn’t see the comments until I bought my yarn–Cascade 220 Aran. I’m using size 8 needles and it seems to be working with the gauge. Yes! You will be preparing the cast on edges of your collar pieces (by picking up stitches along their cast on edges and then binding those stitches off, as illustrated on page 6) and will then sew the collar pieces together. Preparing the edges should allow you to neatly tidy up any bumps or inconsistencies that may have occurred while casting on. I hope this helps clarify and please let us know if you have any further questions! Thanks for writing! It definitely can be a bit tricky to pick up dropped stitches in Fisherman’s Rib and you not alone in trying to figure out how best to do it! Here is a video clip that shows how it’s done: https://www.youtube.com/watch?v=jrd8MtohamI Please let us know if this helps and good luck! Thanks so much, a very big help! I have a problem on the shape right shoulder part. I have 63 stitches. But when I go to the Next row part: I do the K1P1 ,11 times and then k1 but then it is said P1, K1b…I do not have a P1 but a K1b to knit next . What is going on ??? Many many thanks to help ! Thanks for your great question! We did not find that the finished cardigan needed to be wet blocked, only lightly steamed and only after the piece was completely finished. I hope that this helps! Please let us know if you have any further questions and thanks for writing with this one! Could this sweater be classified as unisex? I am interested in making this for my father. Absolutely! This sweater does not have shaping that would make it more suited for a female body. Many men at the shop have tried it on and it looks great on them! Hello Purl Bee. I love this pattern. I am making it in cascade 220. As I work the left back collar (size 38 ¼) I am not properly counting rows because I always end up with 7 inches before I’ve made all the decreases. Is there an easy way to count rows in this stitch? I don’t want to make the piece longer than what the pattern calls for. Secondly, when I work the kyok increase, I get a small hole in the fabric. Do you think I could be following your tutorial incorrectly? I have already had three other questions answered by reading the Q&A about this pattern! Thank you for your expert assistance, and I look forward to hearing from you. Sorry for the lat reply. 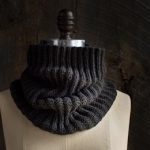 You will be making the collar decreases every 12 rows, which ends up being around every 1 3/8″. The decreases for the collar will be performed with the increases for the armhole at the same time once you get to 7″ from the cast on edge. This means that even if you haven’t finished decreasing the collar at 7″, you will still start the armhole increases. Also, make sure you are measuring from the shoulder cast on edge and not the original cast on edge. The 3 1/2″ should not be a part of your measurement. Hope this helps and please feel free to ask more questions if this doesn’t solve the confusion! Adam, thank you so much for your response. I think I finally got it. I had been measuring from the original cast on edge, but the collar shaping starts at 3 1/2″, so it is from that point that I’m measuring until I reach 8″. Is this correct? I seem to have missed that minor caveat on the last paragraph of page 4 to measure from shoulder cast-on. The good news is after restarting this project four times, I’ve gotten so much more skilled at correcting errors in Fisherman’s Rib! Always a silver lining. You are right! Measure from the cable cast on 3 1/2″ up. Good luck and let us know how it goes! I’m so glad you love the pattern! Counting rows in fisherman’s rib can be tough since it’s a double-sided fabric. This means that for every knit stitch you see, it counts for two rows. As for the kyok increase, you could try knitting or purling the yarn over through the back loop depending on how you are supposed to work the yarn over (be it knitwise or purlwise). I hope this helps you out and that you’ll be able to move on! Hello and thank you for this wonderful pattern! I may be able to finish it for next winter if I start now 🙂 I am just wondering about the seaming. You mention in an earlier comment that the collar will be seamed together, as will the front and the back. Will the front and back be seamed together at the shoulder seams or the side seams? Thank you so much in advance! Thanks for writing in! This sweater has quite a different construction. It is knit top down and the collar and top sides are seamed and after the arm holes, you join in the the fronts and the back and knit them as one for the rest of the length of the sweater. The sleeves are also knit in the round after picking up stitches around the arm hole. This would make an excellent men’s sweater. I wish you would consider remaking this pattern for men! Thanks for writing in! You can certainly make this sweater for a man! I would recommend knitting it a little longer (perhaps measure a sweater that fits the recipient well) and you may need to lengthen the sleeves as well. I’d like to make this pattern for my husband. Won’t I need to flip the button and buttonhole sides? Are instructions included for that? Thank you for this questions! We do not include instructions for this, but I’m confidant you will be able to successfully adjust the pattern. All you will need to do is reverse what is at the beginning and end of your row for the buttonhole rows. Thank you for reaching out! I hear you, short rows can be hard to imagine without a visual discerption. We do have a Video Tutorial, I hope it helps and let us know if you continue to have questions. 1. Although I love the pattern, I find that the fisherman rib difficult to work with, especially if I have to rip out a row and redo it. When I did that, you can see where the row had been reworked; I must have twisted the stitches or something. 2. 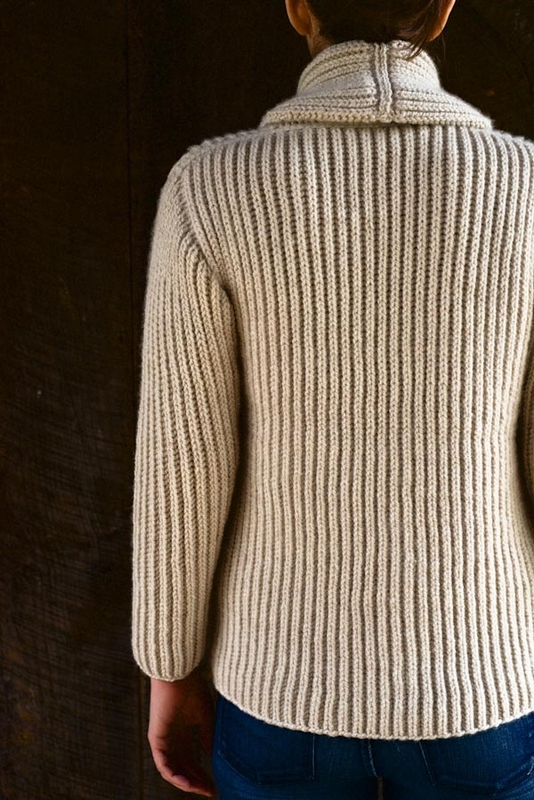 Also, I’m wondering why the fisherman rib is worked differently on the sleeves – why not just use the same fisherman rib pattern that was worked on the body of the sweater, rather than doing the P1B on alternating rows? 3. Lastly, why the short rows on the sleeve? I hope this sweater turns out ok. I’ve worked so hard on it but I’m a bit worried! Great questions! It is true that it is very difficult to unknit Fisherman’s Rib – I myself avoid ripping it out at all costs and sometimes find that it is less obtrusive to leave a small mistake than to go back and fix it! If you google “tinking fisherman’s rib” you should find several helpful videos on fixing mistakes. When you are working the sleeve, the short rows at the beginning create a set-in style sleeve cap – although there are sleeve styles that do not include short rows, we selected this sleeve because it has room for your shoulder to move comfortably without any unnecessary bulk. Once you have completed the short rows the rest of the sleeve is worked in the round, and you do have to work the Fisherman’s Rib pattern slightly differently when you are working in the round with the right side always facing, compared to working back and forth in rows, in order to create the same fabric. I am now working on the body and have a question about sleeve length. Is there a design reason the sleeves are a little short? Is it about proportion related to the lengthnof the body? I lnow I can make them any length but wondered if this was a design decision. Love the pattern. I have a feeling it will be my go to cuddly warm sweater choice! Thank you for your question! The sleeve length is really personal preference- some people prefer them longer some shorter. I would do whatever is most comfortable for you!